Missed this and wow is it a beauty, so glad I got to see it....thanks for sharing! What a beautiful pillow. With the lace inserts and the charming cottage design the pillow looks from the "old world era". It's lovely - where is the design located? I love cottager look things. That's a lot of stitches! It's lovely ! You did a great job! Beautiful - send us some more pictures as you do new projects. What a lovely picture, perfect for a cushion. Well done for persevering and completing it. What size is the design? Fabulous project - you have every right to be proud! 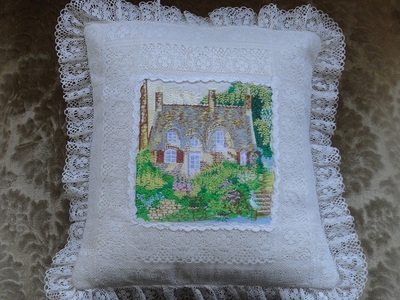 The use of lace and this cottage in this pillow is just perfect. I don't know that I'd ever attemp a project with so many stitches. Do you know what caused your broken needles? Very pretty you did really great on this. Nicely done...looks like an English Garden and Cottage..beautiful! Lovely pillow glad you stuck at it. Beautifully done! Thank you for posting. That looks lovely - well done! Very ambitious for a first project, but you did a great job on this. It looks gorgeous!